Tenants should press for a Subordination and Non-Disturbance Agreement (SNDA) when negotiating their commercial lease, especially in today’s economic climate where foreclosures are more common. Real estate ownership carries with it a complex set of rights, which are typically broken up among different parties. 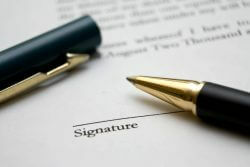 A lease grants certain rights to the tenant, while a loan grants other rights to the lender. Most commercial leases contain a subordination clause, in which the tenant agrees that his rights under the lease are lesser than (or subordinate to) the rights of a lender under its loan. Subordination is a reasonable and common practice, expected of all tenants. If a lender forecloses on a property, that lender can terminate a tenant’s lease and his ability to remain in the space if the tenant is in a subordinate position to the lender. For the tenant’s protection, the tenant needs the lender to execute a non-disturbance agreement. Such an agreement states that, if the tenant is not in default of his lease, then the lender will not terminate the lease in the event of a foreclosure.